When it comes to laying floor markings in chilled warehouses, there can be several issues to overcome, the main ones being the amount of time needed for standard paints to dry at temperatures below 0 degrees means that areas may have to be closed off for anything up to 48 hours, and also the possibility of having to empty complete areas of produce to prevent contamination. Issues such as these can cause major downtime and problems for live operations, particularly if they have to re-coat lines at regular intervals due to the markings fading. 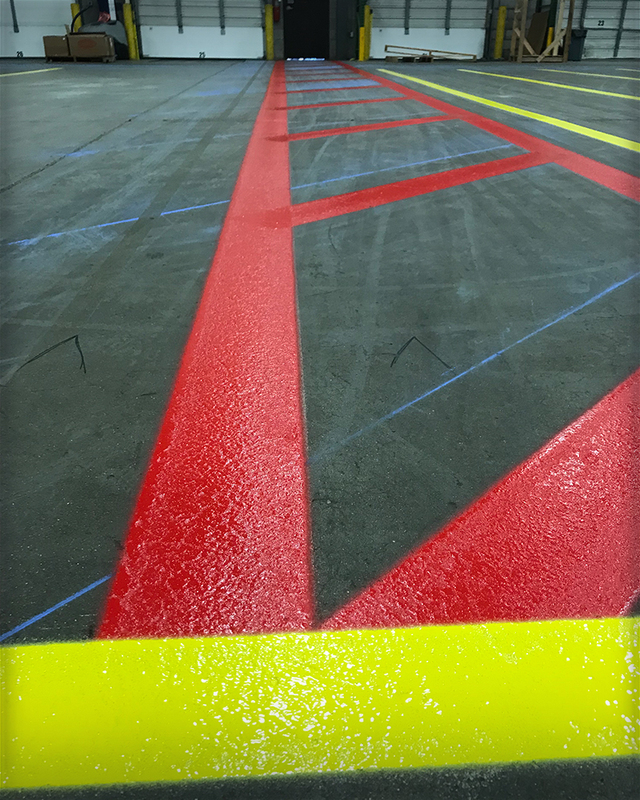 At Warehouse Floor Marking Ltd, we use the latest materials and installation techniques available to make issues such as these a thing of the past. Firstly, we ensure the durability of the new markings by preparing the surface to be painted by vacuum shot blasting, this process involves firing tiny metal beads at the floors surface to remove any power float or surface contamination and leave an open surface that the paint can adhere to. As the name suggests, the shot blasting unit is connected to a large vacuum which collects all the dust & debris produced by the process. Once the area has been prepared, it is then covered with a magnetic roller to ensure all the metal beads have been removed before painting. This means that vacuum shot blasting is not a messy process and is perfectly safe to be carried out in food production or storage areas. Once the surface has been prepared, we then installing the markings using the most up to date & food safe materials available to ensure they are durable and more importantly can be used within a few hours of being installed. We find this is of huge benefit to our clients who need to improve the line markings within their facility but simply can’t close off areas for hours on end. Please contact us to discuss your requirements and concerns with cold store line marking.